Harrison had his $10.5 million 2019 club option declined by Pittsburgh on Wednesday, making him a free agent, Ken Rosenthal of The Athletic reports. Harrison received a $1 million buyout due to this move following eight straight seasons in the big leagues with the Pirates. During the 2018 season, he played in just 97 games -- his lowest since 2013 -- hitting .250/.293/.363 with eight home runs, 37 RBI and three stolen bases. 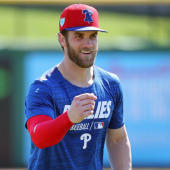 The 31-year-old second baseman will look to find a new home this winter, though Harrison may not get enough opportunities on the field to bounce-back to the fantasy production he enjoyed the previous few years.